To improve the performance on the IntelliJ IDE we need to understand and identify the visual elements present in the main window of Editor. 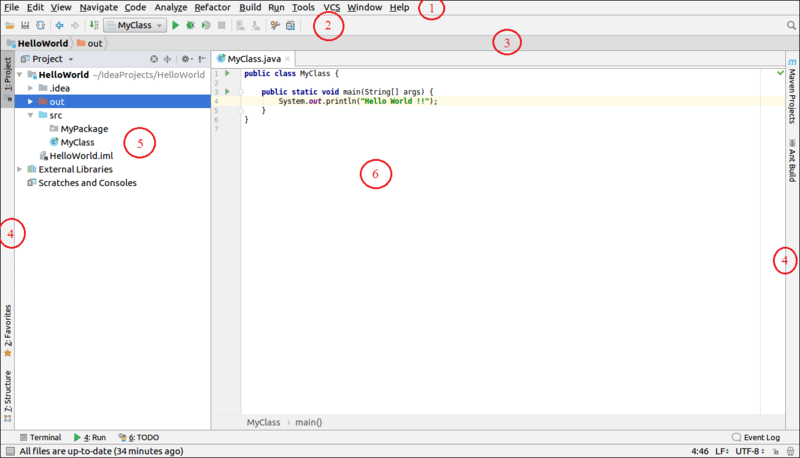 The following screenshot shows the IntelliJ main Editor Window. The main menu bar provides the option which we can use to do a task like Creating New Projects, managing files, refactoring code, build, run, debug option and so on. The tool bar contains the shortcut options to do some acts like compile, debug, run and so on. We can also customize this toolbar according to our needs. This bar is a quick and good alternative to navigate easy and fast through the project files. It is shown on the both sides of the screen and at the bottom of the IntelliJ IDE. Here, we can access some tools directly such as Databases, Maven Projects, Ant Builds and so on. It shows the various elements of project such as packages, classes, modules, workspace, libraries etc. Editor is a place where we can writes our code. Here developers spend their most of the time to develop the code according to the requirements of the projects. Status bar shows the information about the current opening File and the current Project status. It also gives the information about the recent compilation of the projects. We can show the status bar at the bottom of the Editor window.